Design Approach: 16 stops have a typical suburban configuration, two have additional pocket tracks and multiple center platforms. Five stations are located in downtown Baltimore and placed within the street section. The intermodal Camden Yards station includes a temporary building Klaus Philipsen was the project manager for Cho Wilks and Benn, Inc., Architects. The prime consultant was Parson Brinckerhoff/Douglas and Quade. Klaus Philipsen was responsible for client and consultant coordination and coordinated the team of architects with the civil, structural, electrical, sign, and cost estimating consultants and the landscape architect of the project. Responsibilities: Schematic Design/ Programming: The architects assisted in the preparation of the design criteria and the code analysis. 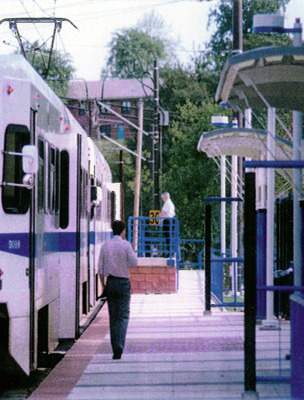 (ADA, BOCA, NFPA 101) Alternative station layouts were tested and the typical station components were established. Howard Street streetscape design, utility coordination, coordination with merchants, presentations. 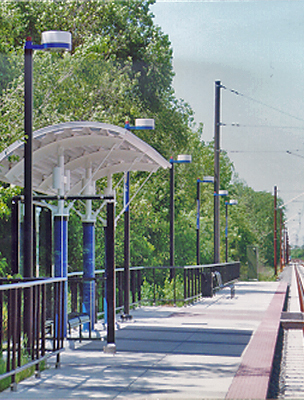 Cost estimating: Initial cost estimates for station components were prepared by architects before they were handled by the PB/MK cost estimating group. Construction Documents: Complete drawings, specifications and details for all station elements, amenities and signs. The architects coordinated their own structural, electrical and graphic design subconsultants, prepared full cost estimates including quantity take offs. Agency Coordination. Coordinate design with the Maryland Stadium Authority and the State Highway Administration. (Camden Station only).